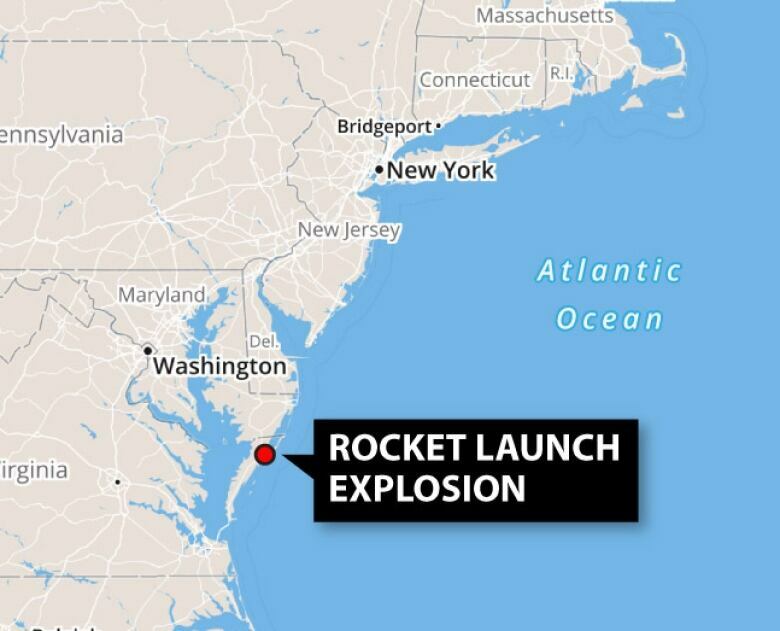 An unmanned commercial supply rocket bound for the International Space Station exploded moments after liftoff Tuesday evening, with debris falling in flames over the launch site in Virginia. No injuries were reported following the first catastrophic launch in NASA's commercial spaceflight effort. NASA is paying billions of dollars to Orbital Sciences and the SpaceX company to make station deliveries, and it's counting on SpaceX and Boeing to start flying U.S. astronauts to the orbiting lab as early as 2017. NASA spokesman Rob Navias said there was nothing on the lost flight that was urgently needed by the six people living on the space station. Orbital Sciences shares fell 14 per cent in Wednesday trading to $26.10 US after news of the accident. Orbital Sciences' Antares rocket blew up over the launch complex, just six seconds after the liftoff. The company said everyone at the site had been accounted for, and the damage appeared to be limited to the facilities. Flames could be seen shooting into the sky as the sun set. There was no hint of any trouble until the rocket exploded. This was the second launch attempt for the mission. Monday evening's try was thwarted by a stray sailboat in the rocket's danger zone. The restrictions are in case of just such an accident that occurred Tuesday. "We will understand what happened — hopefully soon — and we'll get things back on track," Orbital Sciences' executive vice president Frank Culbertson told his team an hour after the failure. "We've all seen this happen in our business before, and we've all seen the teams recover from this, and we will do the same." The investigation will include evaluating debris from around the launch pad, he told reporters. He said a team will look at data to try to determine exactly where the problem started and see if they can determine a sequence of events. The roomful of engineers and technicians were ordered to maintain all computer data for the ensuing investigation. Culbertson advised his staff not to talk to news reporters and to refrain from speculating among themselves. It was the fourth Cygnus bound for the orbiting lab; the first flew just over a year ago. SpaceX is scheduled to launch another Dragon supply ship from Cape Canaveral in December. The Cygnus cargo ship Tuesday had held experiments and equipment. By coincidence, the Russian Space Agency was proceeding with its own supply run on Wednesday, planned well before the U.S. mishap. All the scientists and students behind the science experiments aboard the Cygnus were surely devastated. About one-third of the capsule's contents involved research. Among the instruments that were lost: a meteor tracker and 32 mini research satellites, along with numerous experiments compiled by schoolchildren. The two Americans, three Russians and one German on the orbiting lab were informed promptly of the accident. President Barack Obama has long championed this commercial effort, urging that NASA focus its human spaceflight effort less on nearby orbit and more on destinations like asteroids and Mars. He was in Wisconsin for a campaign rally Tuesday evening and was kept abreast of the accident and its developments. "We are with you @OrbitalSciences and @NASA," former NASA astronaut Leland Melvin said via Twitter. "Very sorry to see the Antares rocket launch failure," said Chris Hadfield, a former Canadian astronaut who served as space station commander last year. "Spaceflight is hard. Very glad that no one was hurt. Now time to sort out why & effects." "It shows the wisdom of having more than one source" for launches, Logsdon said. Nevertheless, he added, "This is going to put the logistics chain for the station under some stress for a period of time." U.S. Sen. Bill Nelson, a Florida Democrat who flew on a space shuttle right before the 1986 Challenger disaster, said in a statement, "Space flight is inherently risky. As we push the frontiers of space there will be setbacks. But our commercial space ventures will ultimately be successful." The explosion also hit Orbital Science's stock, which fell more than 15 percent in after-hours trading.